These are measures to harmonise the use of spectrum and numbering across the CEPT membership. This is to make the use of spectrum more technically efficient to improve market efficiency across Europe. Drafted by consensus, ECC Decisions are widely supported and adopted by individual countries, even though they are non-binding. This provides a sound basis for manufacturers and service providers to prepare to address the European market confidently. The ECC ensures compatibility between its own Decisions and the binding EC Decisions on the same subjects made between the 27 member states of the European Union. This allows the benefits of harmonisation to be fully realised across all 48 CEPT member countries. ECC Recommendations are measures that national Administrations are encouraged to apply. They are principally intended as harmonisation measures for those matters where ECC Decisions are not yet relevant, or as guidance to national Administrations. ECC Reports are the result of studies by the ECC. 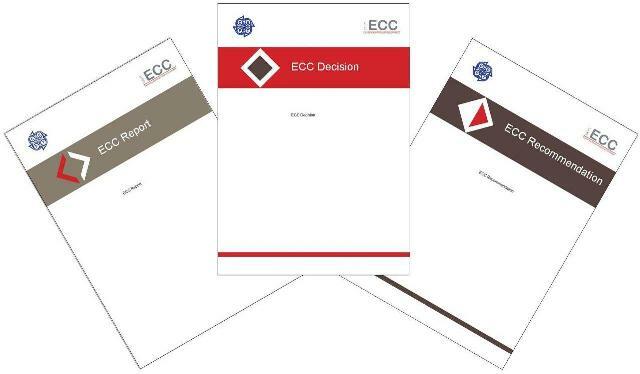 They are developed in support of ECC Decisions, ECC Recommendations or European Common Positions (ECPs) adopted on a voluntary basis by European countries at World Radiocommunication Conferences. CEPT Reports are technical studies carried out by the ECC under mandates from the European Commission. These studies give results that are typically used as the technical basis of EC Decisions on spectrum policy matters.